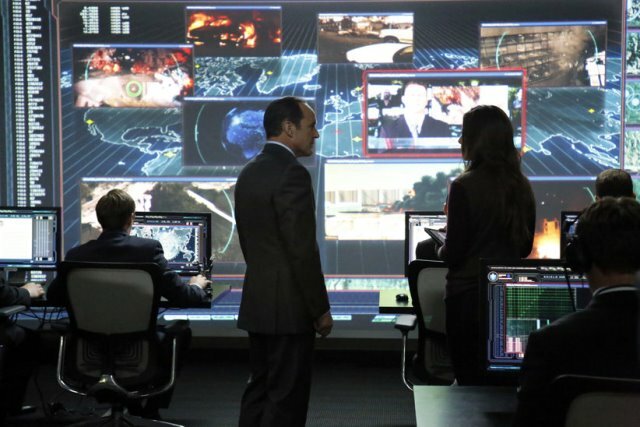 Agents of Shield is gaining speed as it heads to it’s climax and we finally know who that pesky Clairvoyant is! Turns out he was none other than Bill Paxton’s Hydra turncoat Agent Garrett. I have to say I was just as disappointed as the Girl with the Flower Dress, Raina (Ruth Negga). I was kind of hoping that the Clairvoyant would turn out to be a real evil psychic separate from the entire Hydra threat. That said Hydra is the natural enemy of Shield and they work extremely well on the television show. As I predicted in last week’s blog Garret and the other traitor Ward (Brett Dalton) headed to the Fridge and freed those captured there. The most exciting thing raided from that location was the Gravitonium which we know contains Dr. Franklin Hall (Ian Hart) the future super villain known as Graviton who appeared for the first time in, the Asset. I can’t wait to see him get loose since we know he doesn’t have allegiance to Hyrdra. Perhaps his emergence will force Hydra and Shield to work together to combat him near the season’s end. This episode focused a lot on Ward and just how twisted he really is. It was revealed, although I assumed this last week, that he has been a spy since the earliest days of the show. Unfortunately the Agents didn’t learn much from last week’s Hydra infiltration and after Ward was involved in a massive battle at the Fridge they didn’t stop to question why or how he escaped and instead let him right into their new super-secret base. On that subject it was really cool to see Coulson (Clark Gregg) as the only one still totally dedicated to both Nick Fury and Shield. His faith was rewarded when they discovered the new Shield base run by Patton Oswald who informed him and only him that Fury was in fact still alive and kicking. The base itself reminds me of ‘the Hatch’ from Lost, in that it’s underground and contains pictures for different days and such. Agents of Shield has done a great job of bringing in supporting Cast Members this season. Bill Paxton, J. August Richards and now Patton Oswald have been outstanding on the show thus far! I don’t really know what else I can say except that this show has been one of the biggest highlights of my week right behind Game of Thrones!